Halloween is just around the corner, so here are some flicks our staff guarantees will give you a fright. These are letters we received about stories in the September 2004 issue of L.A. Youth. Exploring the difference between Democrats and Republicans was hard says Ashley, 16. It’s hard to make an informed decision, says Farnaz, 18, a first-time voter. Bracy, 18, says having fun, eathing healthier and being organized can help relieve stress. Our writer tagged to escape problems at home, until she got locked up. 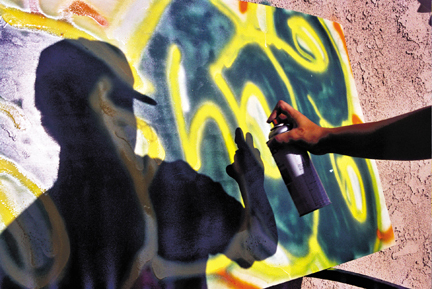 What do you think of tagging? Growing up, I felt like a stranger in my own house. I lived with my dad and my grandparents. My dad wasn’t involved in my life that much and my grandparents were older and I couldn’t relate to them. No one understood me so I kept to myself. I saw my mother every other weekend, but she didn’t show affection, like give me hugs. I had no one to turn to when I had problems, like when other kids at school put me down because I had trouble reading. I was ashamed to tell my family because I thought they would look at me differently. I didn’t want them to know there was something wrong with their little girl. As I got older, things got worse for me on the inside, but on the outside everything appeared to other people to be all good. I would push my feelings down into the pit of my stomach and put on a fake smile. When a friend asked me how I was doing, I would say "good" when I was really feeling horrible inside. To get away from all that stress, I didn’t stay in my house. I skated with my friends around our neighborhood in the San Gabriel Valley. I’d see tagging everywhere and it looked like art. I would see it on the green tarp on fences surrounding construction sites, at the back of supermarkets by the loading docks and on almost every white truck that passed by. I’d skate down the street to an abandoned factory, which my friends and I had decided to make our own place. Taggers would come at night and hit up (write on the wall). The next day the whole wall would be filled up. When I saw the walls, there was a big smile on my face because I thought the writing was so amazing. They used block and bubble letters to turn their nicknames or their crew names into art. (A crew is a group of people who hang out and tag, but it’s not a gang.) The colors were mostly blacks and grays and whites, but there were sometimes other colors too like purple and blue. I really liked the stuff I couldn’t read because I thought the style was so unique. When I was 11, I found out that I could write like them, too. One day I was mad as hell at my dad because he told me that he was going to take me to the movies, but he never showed up. So I ran to my backyard and sat in a chair. I picked up a rock from the ground and used it to scribe (when you scratch into something) my name on the chair’s wooden arms until they were filled up. That night my grandpa yelled at me for writing on the chair. He gave me this big lecture and told me not to destroy his property again. But I didn’t care because I enjoyed it. It looked cool and plus, I did it. It made me feel way better and it also made me forget how my dad had disappointed me. In seventh grade I started defacing school property. I was bored in class one day so I took a safety pin off my jacket and started scribing my name on my desk. My teacher was on me in seconds and yelled at me. I said, "I was just cleaning the dirt from the desk" and she gave me that look that means you’re in deep trouble. The next day, my friend and I were sitting next to the teacher’s desk. We weren’t paying attention to the teacher so I opened my backpack and pulled out a Sharpie. My friend grabbed it from me and put his nickname on the side of the teacher’s desk. Then I took it and wrote my name, which wasn’t very smart because the next day the teacher asked me if I did it. I said no and he laughed and gave me stuff to clean it off with. I continued to hit up at school, mostly in the restroom on the mirrors and in the stalls. I also started writing my name on stop signs with markers after school. I didn’t get caught though, because I learned to write my name so people couldn’t read it. One of the reasons I tagged was that I didn’t like to be at home, because my family was not getting along. I didn’t want to listen to my family taking things out on me and my younger brother, like yelling at us for not being home at a certain time, or hear my grandparents yelling at my dad about being more responsible. So I would leave for a long time. I would skate, hit up walls and sometimes get high and hang with friends. I would be in very good moods after I finished "bombing" on a wall or learning a new trick on the skateboard. I loved seeing the ideas in my mind go through my hand onto the wall to create art. It was something beautiful to look at, more than just a plain wall. Plus, it would release my anger. Tagging became a habit. It was the only way I could express myself without having to speak. I wanted to feel like a regular person. It seemed like all my friends got along with their families, but I didn’t. I never shared my feelings of depression, loneliness and frustration with my family. In my family, like in many Hispanic families, you are not supposed to share your feelings. If you do, you are considered weak. I had too much pride and I didn’t want to show anyone that I was weak. Sometimes I would get stopped by police. During the summer before ninth grade, when I was 13, my friends and I were skating at the park at the grammar school behind my house. We found white rocks and wrote on the wall with them. But people having a party nearby saw us and yelled at us to stop. We kept writing and they finally called the cops. The cops came and made us clean the wall. Then they gave us a ticket for vandalism of school property. I got grounded and couldn’t go skating for a while. My grandfather said, "You should know better than that." But I didn’t stop tagging. When I started high school I wasted my bus money on cigarettes, so I would end up walking home from school. I passed abandoned stores and after a week of seeing a whole bunch of tagging on the windows, I wanted to be part of it. I picked up a rock and scribed my name on the window. I did this almost every day on my way home from school. One day I was supposed to spend the night at my friend’s house, but I left to buy some bud. While I was away my aunt called to check in on me and my friend’s mom told her I wasn’t there. My aunt and my friends found me walking down the street. I froze and then ran. I spent the night at another friend’s house, then the next day I went back home. After that experience of being with no rules and no family arguments, I wanted more. The next month, I ran away. I stopped going to school and I stayed with friends. I would go for "walks" and steal spray cans from stores and write on dumpsters, walls and the sidewalk. I would do this the whole day, then show up at my homegirl’s pad with spray paint all over my hands. That May, when I was 14, I got arrested for drug possession and running away from home. I served two months in juvenile hall, then they stuck me in drug rehab. I ran away, and two months later I was arrested for drug possession again. I got busted a few more times and was in and out of the system over the next year. I kept using drugs because I was trying to hide the pain and frustration I felt. I got arrested again right before I turned 16 and got sent to a detention camp in Los Angeles called Dorothy Kirby Center. I had a bad attitude at first because I didn’t want to be there. If the staff told me to do something, I wouldn’t listen. In school I didn’t pay attention and I was getting Cs, Ds and Fs. I would get caught for tagging in the books. My dad would come visit and get sad because the staff told him I was doing horrible. My dad would tell me, "There’s so much out there for you. Why waste it in here?" You get gang strikes if you tag at Kirby and if you get too many, you are out and on your way back to juvenile hall to start your time all over again. I got a few gang strikes, but I never got sent to juvenile hall. It took five months, but I finally learned that this is not the place to tag. I eventually turned things around and started doing better because of my family. They stopped drinking and doing drugs. They changed their way of life and that showed me that anybody can change, including myself. The staff at Kirby also helped me. They told me, "You’re better than that." I left Kirby last month. I’m doing good. I don’t party anymore. I like to hang out with my friends and have fun without drugs and alcohol. I’ve finally realized I’m better than all the illegal stuff that I did. I’m making it. I’m still going to tag, but I will play it smart and do it the legal way, like on a big piece of plywood in my back yard. In order to stay out of jail, I will have to follow the law. I do not want to spend another piece of my life in the "system." Detention camps and juvenile hall are horrible places to grow up and spend some of what are supposed to be your best years. Not all taggers are troublemakers, some just choose to be. I wrote on the walls to express myself, but I’m not a bad kid. I’m just misunderstood.